In a fine article, Dancing at a Wedding (Early Music magazine 2008 here) Virginia Christy Lamothe offers “some thoughts on performance issues in Monteverdi’s ‘Lasciate i monti’ (Orfeo, 1607) from her particular viewpoint as a musicologist and dancer. In a chapter for the multi-authored book edited by Timothy Watkins, Performance Practice: Issues and Approaches (Ann Arbor, 2009) she applies her expertise to Monteverdi’s Ballo delle Ingrate. 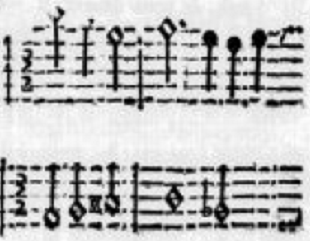 Lamothe examines these staged dances in the light of Roger Bowers’ theories of highly conservative, ‘medieval’ notation of Proportions (Bowers on Proportions in Orfeo here). Her own contribution is to place these dances in the context of period manuals for social dancing, Caroso Il Ballarino (1581) here and Negri Le Gratie d’Amore (1600) and Nuovi Inventioni di Balli (1604) here. There is certainly much to be learnt from Lamothe’s approach, to which we should add information specifically about theatrical dancing, in particular the Preface to Cavalieri Anima e Corpo (1600) here and the anonymous c1630 treatise Il Corago (edited by Fabbri & Pompilio here). Both recommend that a ballo should be choreographed by an expert dancing-master, both mention specific dance-steps, continenze, gagliarda, canario that we see also in choregraphies for social dancing. 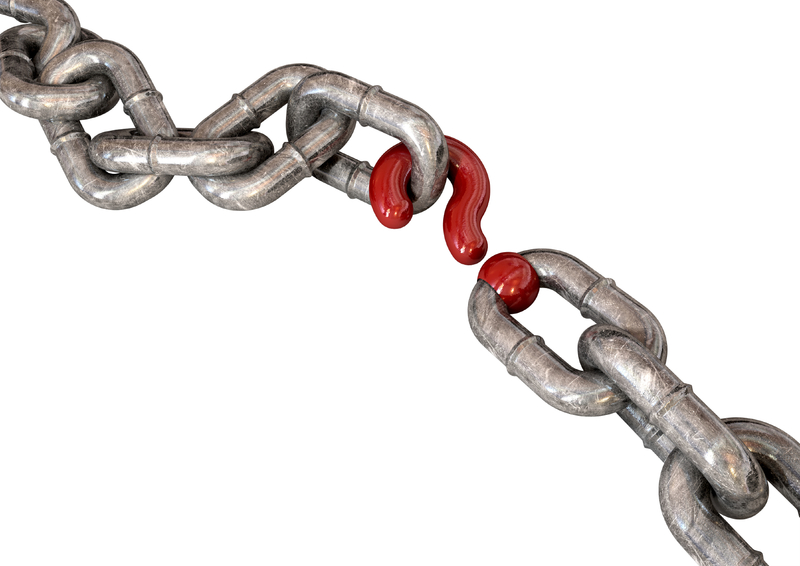 Cavalieri identifies slow steps such as riverenze, continenze and other passi gravi which are performed by the whole company con gravita. He suggests that singers might dance with instruments in their hands, and reminds us of his famous all-singing, all-dancing finale to the 1589 Florentine Intermedi, the Ballo del Gran Duca. But he distinguishes these slow, walking steps from the kind of ballo saltato (jumping steps) with gagliarda, canario, capriole (capers) etc, that would be performed by dance soloists (either two or four, depending on the size of the stage) without singing. 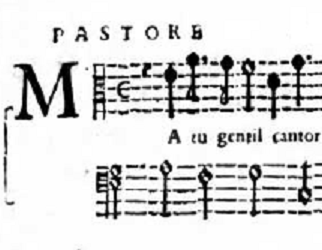 The stage directions in the original print of Monteverdi’s Orfeo describe Lasciate i Monti as a balletto (diminuitive), and indeed it is small-scale compared to Cavalieri’s 1589 spectacular. It is shorter than many choregraphies for social dances. But nevertheless, the ensemble is larger than for Monteverdi’s Tirsi & Clori, designated a ballo. Here, in Orfeo, we have 5 voices and 13 instruments. I will write about the instrumental ensemble in another post. 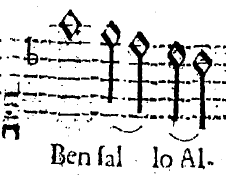 This balletto has three sections, in three time-signatures: C, 3/2, and 6/4. Lamothe equates these with three movements commonly encountered in social dances: a opening section of riverenze, continenze and other passi gravi; a central gagliarda; a final salterello (jumping dance). The dotted rhythms of the final section of Lasciate i monti strongly suggest one particularly vigorous dance, the canario. I agree with these identifications of the first and third sections. But I am not convinced that the central section is a gagliarda. It’s not a problem that the first phrase starts with an upbeat qui | miri il sole – Lamothe’s gagliarda example from Caroso does this. But Monteverdi chose to make every phrase start this way, even when the word-accents suggest something different vos- | tre carole. In contrast, galliard phrases normally start on the first beat of the bar, even if the second note takes the word accent. As Lamothe writes, “Specific types of dances followed particular rhythmic patterns.”. “Each galliard step requires six counts”, including gettati in aria, throwing yourself into the air, on the fourth count. But the phrasing of qui miri il sole consistently contradicts the phrasing of the galliard step. If Monteverdi had wanted a galliard here, he could have written it like this. Not everything in 3/2 is a galliard. Many of Negri and Caroso’s social dances include movements in 3/2 that are not galliards. Cavalieri tells us that theatrical galliards are danced without singing. 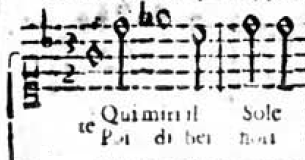 I conclude that Monteverdi’s sung 3/2 movement, Qui miri il sole, is not a galliard. As we try to identify the three sections of Monteverdi’s 1607 balletto, there is an excellent match with Cavalieri’s 1600 ballo, the grand finale of Anima e Corpo, This is a larger-scale piece, with six strophes and many singers (Cavalieri asks the whole cast, whether on or off-stage, to sing). But the essential structure is the same: C (sung, major mode); 3/2 (sung, minor mode); jumping dance (major mode, instrumental). The texts of both link the movement of celestial bodies to earthly dancing. 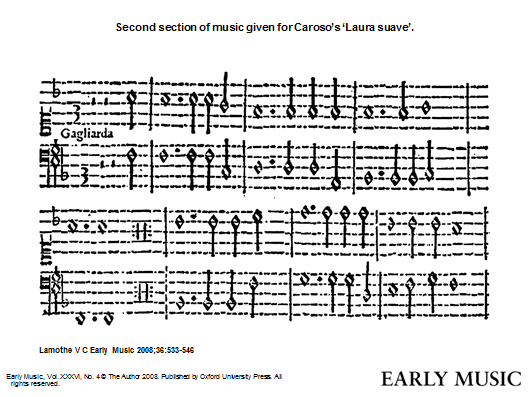 Cavalieri’s central movement also begins before the beat, in this case with two upbeats – it too, is not a galliard. C (sung, major mode, could be danced by singers, riverenze, continenze etc) This section is con gravita. Cavalieri’s ballo has six strophes, so this particular sequence of three movements comes three times. Monteverdi’s balletto seems also to come three times: the sequence is two iterations of the balletto , some dialogue, and a final reprise of the balletto. One of the challenges in reconstructing choreographies of this period is figuring out the precise repeat schemes. Lamothe problematises the repeats of the various sections of Monteverdi’s balletto. The music of the C section is written out twice, with a new text the second time; the 3/2 has the music written out only once, with two strophes of text underlayed; the 6/4 is written out twice, but when the whole ballo is reprised a few minutes later, the repeat of the final section is indicated by repeat marks. Whilst period choreographies show many different repeat schemes for different dances, the ABC ABC form usually adopted for modern performances of Lasciate is not typical of Negri and Caroso’s social dances. However, we’ve seen that Monteverdi’s balletto is closer to Cavalieri’s staged ballo than to social dances. I agree with Lamothe that the question of repeats is problematic. There is much to be said for her suggestion of ABB*C. (B* means the B music with a new text). The effect for the listener is logical, since Monteverdi’s music has writtten-out repeats for A and C sections, but not for B. So the listener (unaware of how the music was notated) would hear an effect of AA*BB*CC. (The C section is untexted, of course). If one agrees with this logic, then the reprise of the ballo (a few minutes later) could be taken the same way. I recommend this solution. But I do not rule out (as Lamothe does) the ABC AB*C …. ABC that we hear in many performances today. 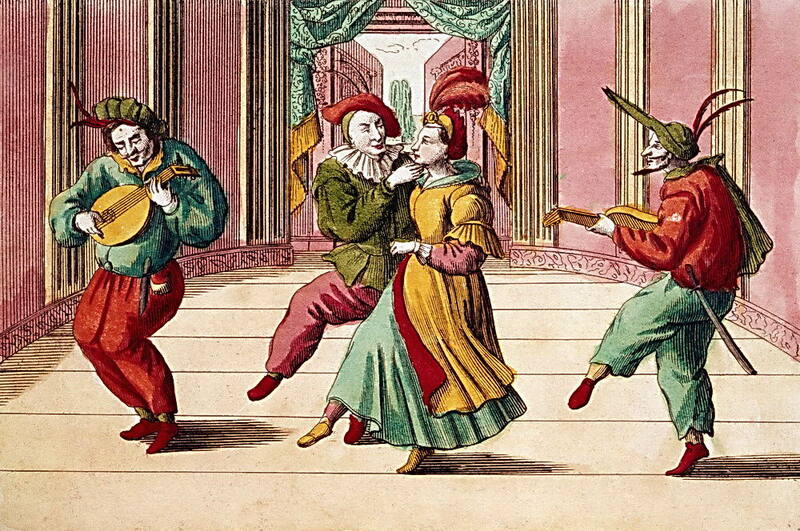 Her example of a social dance by Caroso is an arrangement of Cavalieri’s Ballo del Gran Duca (1589). Tellingly, the original theatrical ballo and the social dance arrangement have different repeat schemes. Theatrical and social dances were related, but not identical. Lamothe draws attention to particular features of the Galliard movement in social dances, in particular that it is often specifically marked as gagliarda. She suggests that this implies the tempo of the galliard could be specific to that dance (i.e. not in proportion), or variable. Certainly it is true that the physical demands of this jumping dance require that the dancing master has just the tempo he needs. In The Harp Consort, our standard operating procedure for galliards (when performed as a single item, i.e. not as part of a larger ballo ) is to allow the dancer to set the tempo. Contrary to what one might at first suppose, a slow galliard is physically more demanding than a fast one. At a slow tempo, the dancer must remain in the air longer – this allows more time for capriole, leg-beats in the air – which inevitably requires a higher jump. So slow galliards are more ornamented (just as with musical ornamentation in madrigali passegiati, where a slower Tactus may be taken). And slower, ornamental galliards with their extreme physicality were particularly for men. Lamothe cites Yvonne Kendall, a scholar of early dance and music, who “reminds us that … the rhythm associated with a particular dance may not be tied to a particular metre signature.” Monteverdi notates galliard sometimes in 3/2 minims (which I take to be tripla, i.e. three minims to one tactus at about MM60). This is a fast tempo, and we find it for example in Ballo delle Ingrate, which was danced not by singers, nor by the dancing-masters, but by the aristocratic ladies of the court. But in the ballo ‘De la bellezza le dovute lodi’ the galliard is in 3/2 semibreves (which I take to be sesquialtera, i.e. three semibreves to two tactus beats). This is a slow tempo, and is set to the words Ben fallo Alcide il forte referring to that mythical strongman, Hercules. The agreement of fast/slow tempi with the physicality of fast/slow galliards and with texts associated with women/men seems to support my interpretation of proportions, in which the note-values (minims or semibreves) give us the information we need, to choose between tripla and sesquialtera proportions. By the way, in the cantus primus part for ‘De la bellezza’, there is no time-signature for that same galliard at Ben fallo Alcide. According to Roger Bowers’ theory, this would be a fatal error, a singer would not be able to interpret the notation. According to my theory, the absence of a time-signature is a minor problem; the time signature doesn’t tell the singer anything they didn’t already know. We see the same idea with her example from Caroso’s social dance, where the final jumping dance is specifically identified as a salterello. The fast tempo and dotted rhythms might otherwise have suggested a canario (although there are other rhythmic clues in Caroso’s salterello that would contradict an initial diagnosis of canario). We should move away from the conventions of Grand Opera in the Romantic period, away from the modern categories of soloists, chorus and corps de ballet. The first ‘operas’ were performed with small casts, who doubled several roles. Soloists often sang as the chorus, too. Chorus members, even soloists might dance. Lamothe takes into account Tim Carter’s calculations of a company of 9 or 10 singers, a typical size for early ‘opera’, that could have performed Orfeo. But there is strong argument that the first performance in 1607 involved only 8 singers, SSATTBB plus Francesco Rasi as Orfeo. Either way, the singers for the balletto will be mostly, if not entirely, one-to-a-part. It is possible that singers might sing one-to-a-part and simultaneously dance. 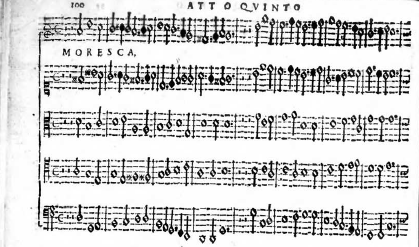 This was done by the three female soloists in the 1589 Ballo del Gran Duca – they even played instruments too! But castrato Giovanni Gualberto Magli, who sang three roles (plus chorus parts) in Orfeo, arrived in Mantua eight days before the performance, knowing only the Prologue, and much concerned about ‘so many notes’ that he had to learn. I find it implausible that he would have learnt a dance too, although period commentators report that he performed well when it came to the show. Certainly, singers could not have sung Qui miri il Sole one-to-a-part and simultaneously danced a galliard, with its combination of three low jumps and one high jump every two seconds. (Try it for yourself!) At most, they could have done some passi gravi during this section. This supports my argument that this section is not a galliard. In Mantua in 1607, female courtiers were not allowed to appear on stage – that is why castrato Magli had to be brought in from Pisa. I assume that this prohibition would apply to dancing just as much as to singing. 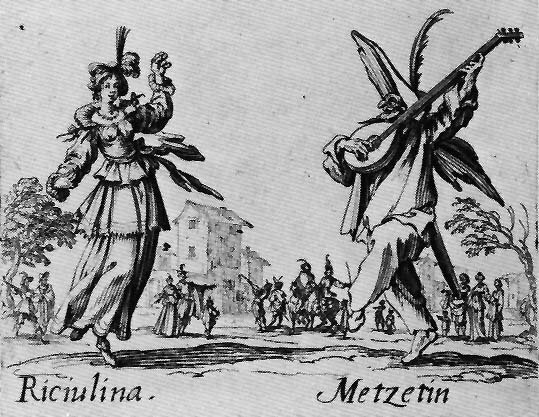 The courtly ladies who danced the Ballo delle Ingrate in 1608 (that year saw a change of policy, which also allowed La Florinda to sing the title role in Arianna), could not have represented the ninfe who are invited to leave the mountains and dance the balletto in 1607. The most likely explanation is that the dancers were the court dancing-masters. On the model of social dances, they could have danced all three sections. Or ,on the model of Cavalieri’s theatrical ballo, the singers could have done simple movements (riverenze, continenze etc) in the slow C movement, and other passi gravi in the sung 3/2 (but not a jumping galliard). The instrumental Ritornello then featured a jumping dance, almost certainly a canario, performed by the (male) court dancing masters. Maybe four, or perhaps just two of them, since the performing space for Orfeo was small, and there are already 13 musicians and 5 singers on stage. One of the court castrati, Issachino Massarini, was also a dancing-master (though he was elderly by 1607). Lamothe speculates that this singer might have sung the role of Euridice, and also danced the balletto. In this interpretation, Rasi as Orfeo would also have to dance the balletto. I haven’t found anything about Rasi’s dancing skills (he was a singer, theorbo player and composer), but I’m sceptical that he would find dancing a vigorous canario the ideal preparation for his great song, Rosa del Ciel, which comes about half a minute afterwards, even if he was not needed for the chorus parts of the balletto. I also find it hard to believe that old Issachino would have managed the sequence of ballo choruses, galliard dancing, and Euridice’s recitative, followed by more chorus-singing, another galliard and the chorus Vieni Imeneo, all in the space of a few minutes. Nevertheless, Lamothe’s suggestion reminds us that a male dancing master might have danced this balletto as a female character, just as the castrati singers sang female roles. 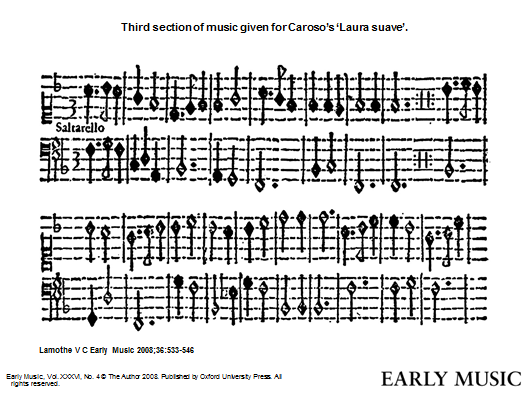 Another possibility is that some of the 13 on-stage instrumentalists could have danced and played – more plausibly in the passi gravi of the first two movements, than in the canario. But since Stephen Player of The Harp Consort has often played guitar whilst simultaneously dancing a canario, perhaps there was a dancing-master or two amongst Monteverdi’s players. Perhaps not the bass-violinist, harpsichordists or the harpist, but what about the three chitarrone-players? We do have period images of dancers with lutes and long-necked instruments. Part of Lamothe’s argument is that Proportions might not apply to dancers. Dancers (and many conductors) are sometimes reluctant to struggle with the intellectual and practical challenges of Proportions, but period philosophy and historical musicology combine to emphasise that they are essential. Ha, ha, keep time! How sour sweet music is / When time is broke and no proportion kept! To support the argument for inconsistency, Lamothe cites musicologist Jeffrey Kurtzman, who is certainly correct to draw attention to the complexity of evidence from period theorists. 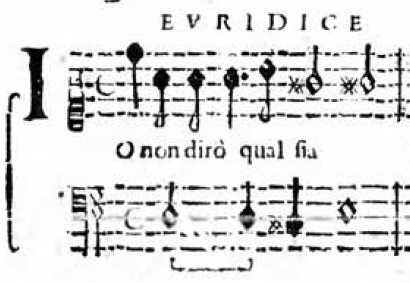 Working within the scholastic method, theorists had to reconcile the new practices of the 17th century – Monteverdi’s seconda prattica, the novelty of continuo-notation and (I argue) a simplified use of proportional notation – with the conservative traditions of previous generations. As George Houle observes in Meter in Music 1600-1800, changing usages were fundamentally incompatible with older notation systems, and the theorists’ attempts to unite the irreconcilable were confused, confusing, and in vain. I do not see that inconsistent realisations could work, in a period when there was often no rehearsal at all. And I do not agree with Bowers’ position, that musicians of Monteverdi’s generation were still putting into practice highly conservative, ‘medieval’ systems – Bowers’ theories are too complicated to work in real time, when sight-reading. Yes, something of the old ways was conserved in the notation, and period theorists struggled to make sense of this. 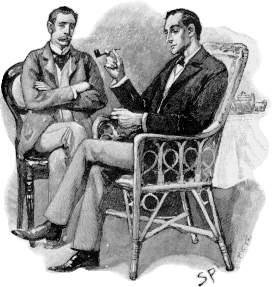 But the actual Use had moved on, and (as just continuo notation replaced intabulated accompaniments) the practice (as opposed to the theory) of Proportions had been simplified, made more practical. Practical musicians must have found workable, consistent solutions. You can examine my theory of proportions here. In addition to arguing that period musicians realised Proportions consistently, I also reject the suggestion that 17th-century dancers had a different way of thinking. Such a divergence may happen today, but the familiar concept of the Renaissance Man reminds us that historically there was an aesthetic unity across many artistic disciplines, guided by high philosophy, i.e. period Science. In Mantua, Massarini danced and sang; Rasi composed, sang and played theorbo; Monteverdi sang, composed and played the viol. Elsewhere we know of dancer/swordsmen, swordsman/vihuelists, and many dancing violinists, and continuo-playing singers. It’s clear that there must have been a consistent approach across all these disciplines. We must therefore synthesise all the available information. There thus appears to be every indication of the prevalence of a single tempo for the entirety of these pages, the fundamental durations of the unblackened semibreve, minim and semiminim remaining constant throughout. Houle goes further, showing considerable evidence of the same Tactus for the entire repertory, within this period. But this ‘single tempo for the entirety’ must be minim = approx 60, not semibreve. The confusion here is one that we find in period sources too, between Tactus (which strictly means the complete down-up movement) and Semi-Tactus (which is the proper name for the down-movement alone, or the up-movement alone). Many sources use the word Tactus for both, which leads to some theoretical confusion. or the chorus afterwards, Vieni Imeneo. All work well at around minim = 60, none could be imagined at semibreve = 60! So, according to the well-agreed principle that the whole work has a unified Tactus, around MM 60, I’m convinced that the C section of Lasciate goes at approximately minim = 60. 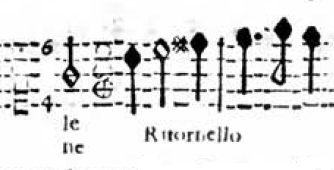 This is slower than many modern performances, but corresponds to the period description of this kind of movement as con gravita, with passi gravi. And here is perhaps the most powerful tool for the scholar of Proportions. If we combine the period principle of Proportions with the period principle of Tactus, we can eliminate many theoretical options as impossible. Starting with minim ~ 60 for Lasciate i monti (unfamiliar to our modern ears but certainly possible), the big question is what proportional relationship to apply at Qui miri il sole. If we follow Bowers’ theory and apply Sesquialtera to Qui miri il Sole, we would have dotted semibreve (three minims) = 30, i.e. minim = 90. I find this too slow for Qui miri, but not necessarily impossible. (Bowers himself arrives at a faster tempo, by applying Sesquialtera, but starting impossibly fast in the previous C section). But what about the Ritornello after the balletto reprise? Or (killer example) the final Moresca at minim = 90? Impossible! Alternatively, if we apply the very fast (Sextupla) proportion to 3/2 Qui miri il Sole, we would get dotted semibreve (three minims) = 120.. I find this too fast, but not necessarily impossible. But now the 6/4 canario would be dotted minim (three crotchets) = 240. Impossible! Dotted minim = 240? Impossible! My practical theory of proportions (here again) indicates Tripla, dotted semibreve = 60 for Qui miri il Sole. (This would work as a fast galliard tempo, but I don’t think this is relevant, since the movement is not a galliard.) Then the canario comes out at dotted minim = 120 (i.e. the same dotted semibreve = 60 as in the previous movement). This (as Latrophe agrees) is a good canario tempo. I find this balletto an interesting and significant test-case, for which my theory of Proportions provides a plausible solution. 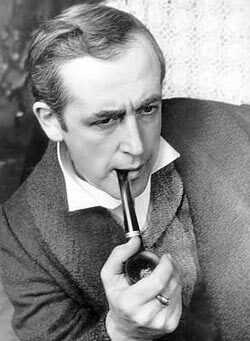 But I’m certainly not so arrogant as to insist that anyone else should accept my theory. 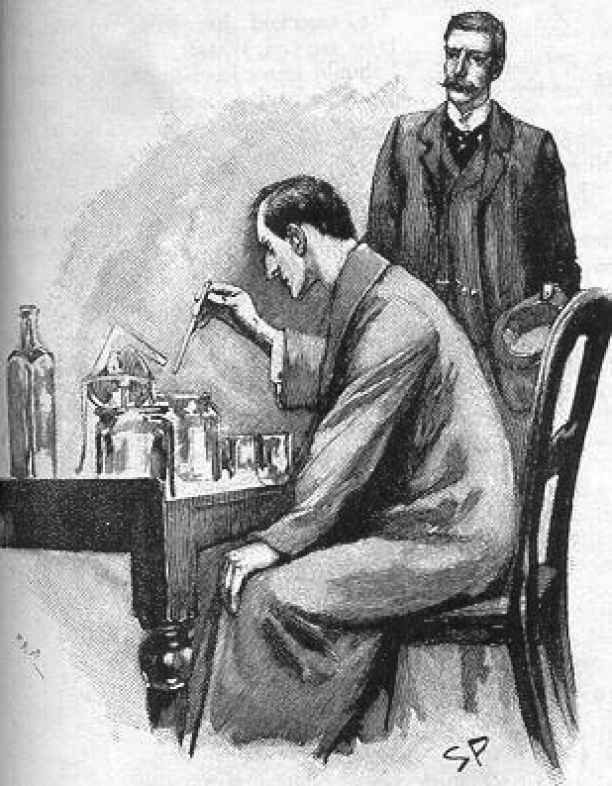 And I’m just having some fun by quoting Conan Doyle, even if investigating period performance practice can be something like Holmes’ Detective Science. 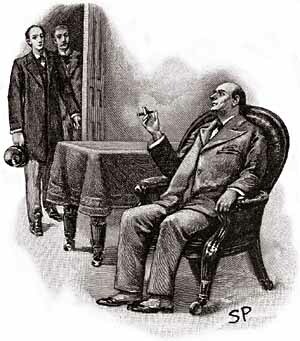 However, I do suggest that you might apply my methods to test your own theory of Proportions. A good theory should be consistent, unambiguous, and easily applied for quick decisions in the real world of practical music-making. You know my methods, apply them! Bowers’ reference to “these pages” relates (most probably, though he is not totally clear about this) to the section beginning with the Sinfonia to Act 2 and ending with the entrance of Messaggiera. At the most it relates a bit further back to the repeat of “Lasciate i monti”, but there is no suggestion that he means “the whole opera”. 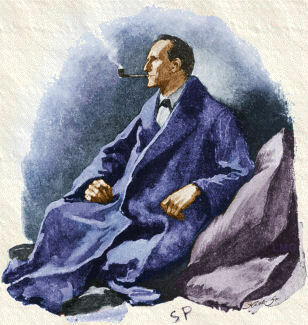 (see his article, page 150). And he nowhere suggests anything like a tempo (unless you count the word “quickish”), since his concern is solely with the meaning of the notation. “The speed of tactus was quite variable …” (page 7 and following). And so, to set up examples from the recitative sections of L’Orfeo (viz Pastore “Ma tu gentil cantor..” and Euridice “Io non dirò ..”) as “impossible” examples of a tempo of semibreve = 60 doesn’t really get us anywhere. Where does Andrew think that either Bowers or Houle suggest that? However, I do firmly believe, as Andrew clearly does, that tactus was an essential structural constant that could unite consecutive and contrasting passages in logically proportionate tempi. On the face of it, the section which Bowers identifies, running from the Sinfonia to Act 2 up to the entrance of Messaggiera, is exactly such an instance, because of the succession of mensural signatures and the absence of intervening double barlines or fermata (the same is not true of the passage from “Lasciate i monti” up to the end of Act 1). Here, if one follows through Bowers’ notational logic, one ends up with a pretty fast tempo for “Vi ricordi boschi ombrosi”, as he says. Personally, I find that persuasive both musically and dramatically, but I have yet to experience it in performance, due to directorial intervention. To return to the starting point of Andrew’s discussion, the three sections of “Lasciate i monti – Qui miri il sole – ritornello” provide another likely instance. I am very interested to read all the references to, and discussion of, dance implications, and, like Andrew, find it unconvincing to classify the central 3/2 section is a ‘gagliarda’, therefore requiring a certain character of steps. But I would be cautious of drawing too many parallels between this Balletto and the Ballo at the end of Cavalieri’s 1600 Anima e Corpo. Andrew suggests that “The texts of both link the movement of celestial bodies to earthly dancing”. Whilst this may apply to the 3/2 sections, I can’t see it having useful relevance to the opening C section, addressed to the “Ninfe vezzos’e liete”, which is surely sprightly and joyful in character, rather than ‘con gravità’. It seems to me that Andrew’s suggested tempo – the one which he would apparently like to apply more or less the whole piece – of minim = 60 makes no sense here, either of the decorative contours of the upper parts or of the harmonic movement or of the meaning of the text. He sets up another straw man by rejecting the application of what he terms “Bowers’ theory” to this tempo to arrive at minim = 90 for the following 3/2 section, which is, of course, improbably slow. It is quite clear that Bowers is not proposing this, since his analysis of the notation is that sesquialtera applies to the semibreve, i.e. semibreve of the C equates to dotted semibreve of the 3/2. According to Andrew this presupposes a tempo for the opening section that is “impossibly fast” (albeit, one which Bowers never states in terms of a metronome marking). I disagree. I suggest a tempo of something like semibreve = 52 for the opening (not a minim tactus, for reasons which I am coming to) becoming dotted semibreve = 52 for the 3/2, and finally bar = 52 (i.e. the ‘new’ semibreve = 52) for the 6/4: in other words a constant tactus, but at a different level. This incidentally has the effect of making all three sections practically equal in length and ‘real time’ (well, either 15 or 16 imperfect or perfect semibreves, depending on how you interpret the dovetails), which, I suggest, carries a certain conviction. It does admittedly involve treating the central section of the first “Lasciate” as not being repeated. (No repeat is marked, of course, but a second verse of text is underlayed. I subscribe to Andrew Parrott’s view that this is a printer’s error, and that the second text should have been printed in the second “Lasciate”, instead of the repeated underlay of “Qui miri il sole”. This would result in an ABC form for each chorus, though, as Andrew (LK rather than P) points out, the uninformed listener would hear it as AABCC, because of the written-out repeats in the outer sections. This has a perfectly satisfactory symmetry. What is hard to believe is the format as it is printed).